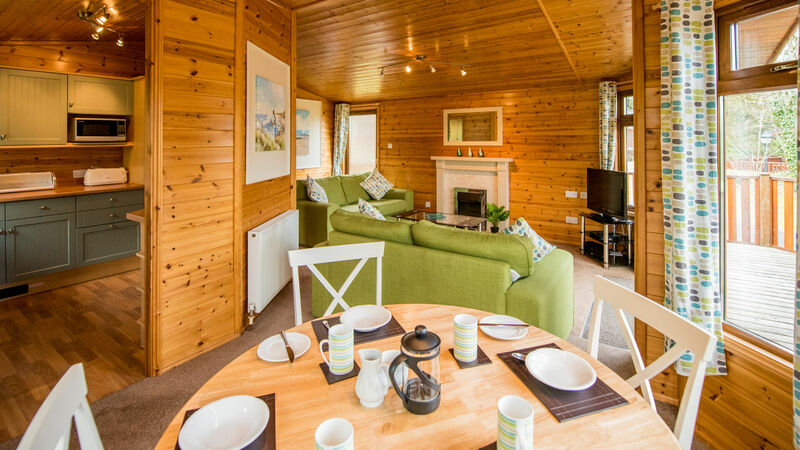 Enjoy holidays early or late season with our luxury holiday lodges in Cornwall. 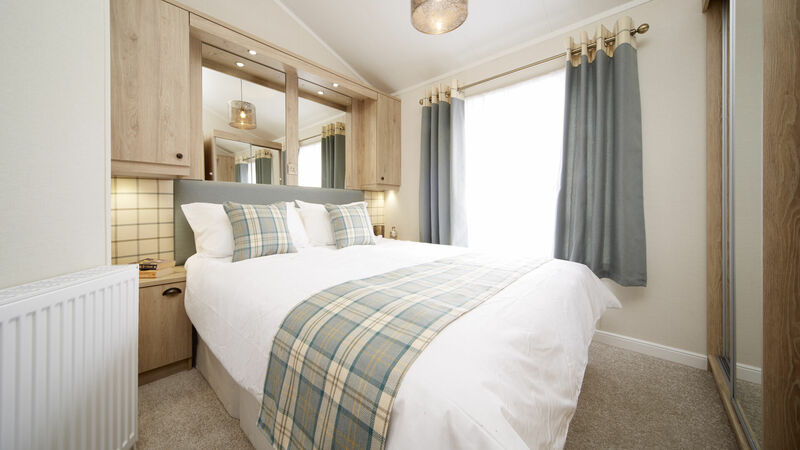 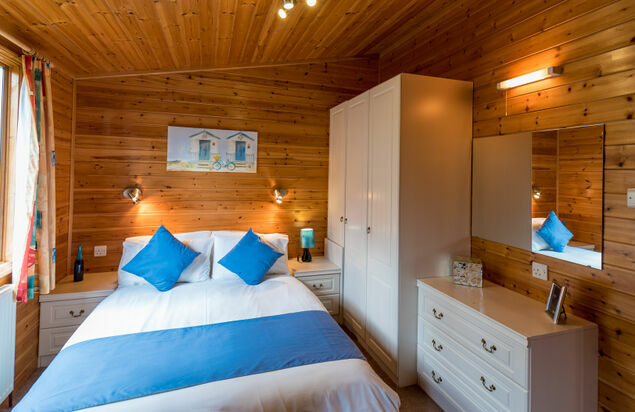 Our luxury lodges at River Valley Country Park have features that include double glazing, central heating, dishwashers, DVD, radio & CD player, pillows & duvets with linen, decking to front and some of our lodges even come with a hot tub! 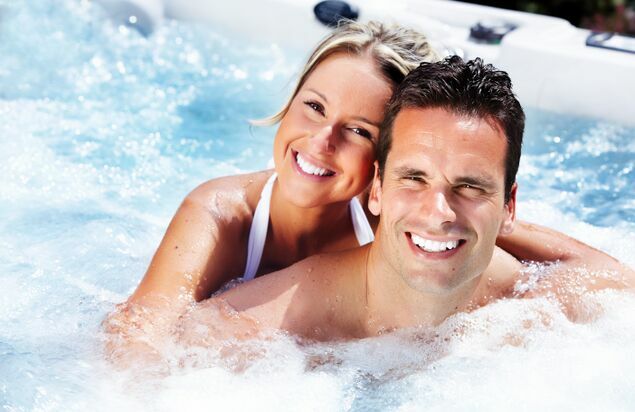 The following results are for multiple parks in different locations. 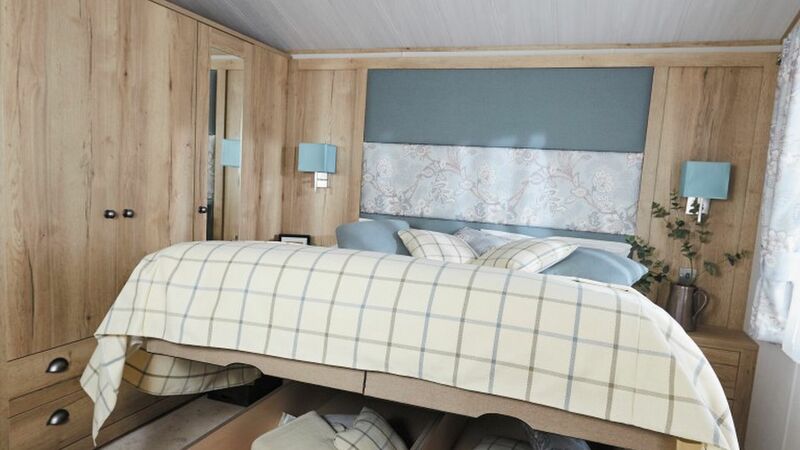 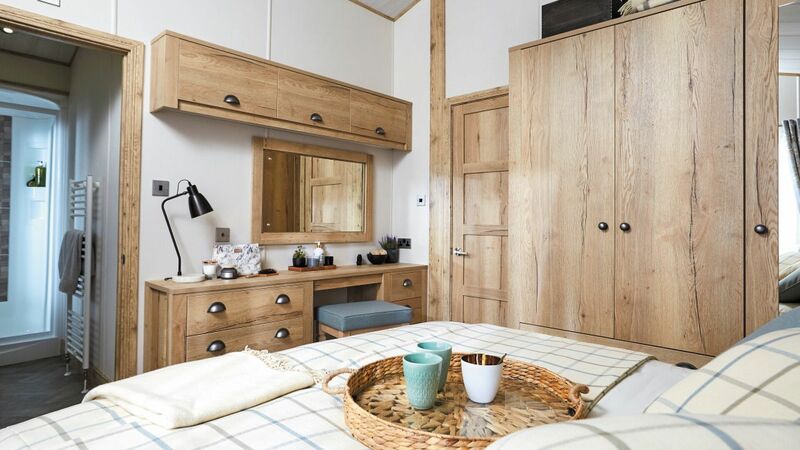 This spectacular three bedroom luxury lodge is brand new for the 2019 season and offers a modern and stylish open plan living space, all your home comforts and a few extravagant luxuries. 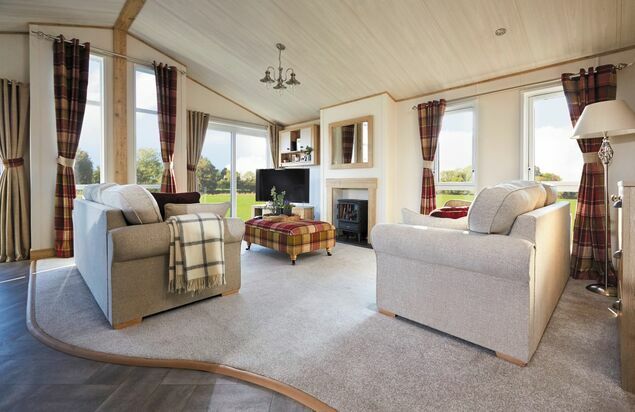 The beautiful Larch Plus has huge cathedral style windows in the lounge area that make this space warm and inviting and also provides you with some of the glorious scenery that River Valley has to offer. 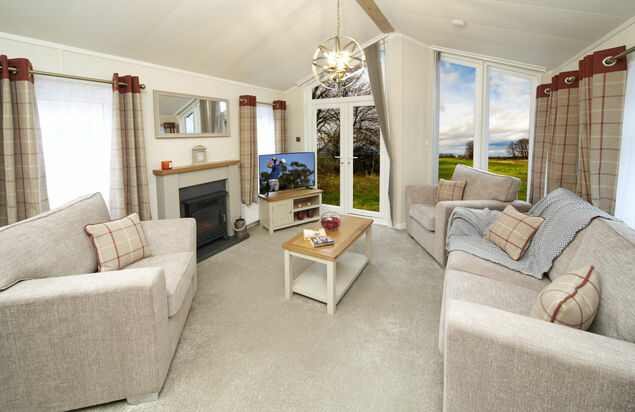 Snuggle up on the sofas to read a good book in front of the fire, watch a DVD or listen to some of your favourite tunes on the integrated Bluetooth sound system. 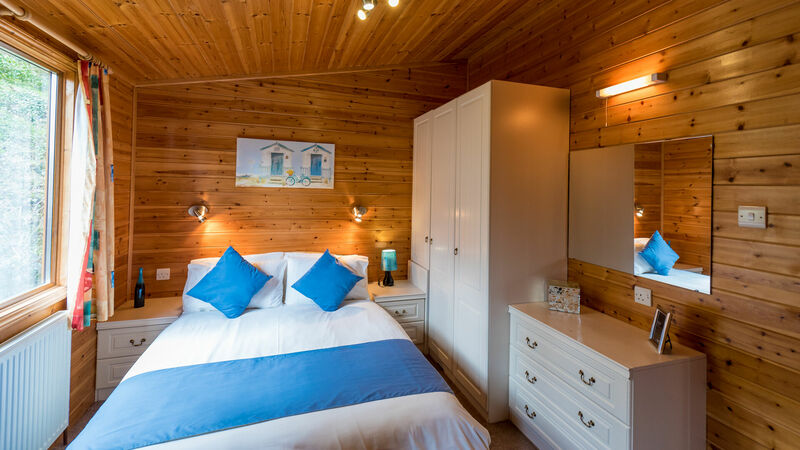 Whatever you choose to do during your stay you“ll be doing it in style! 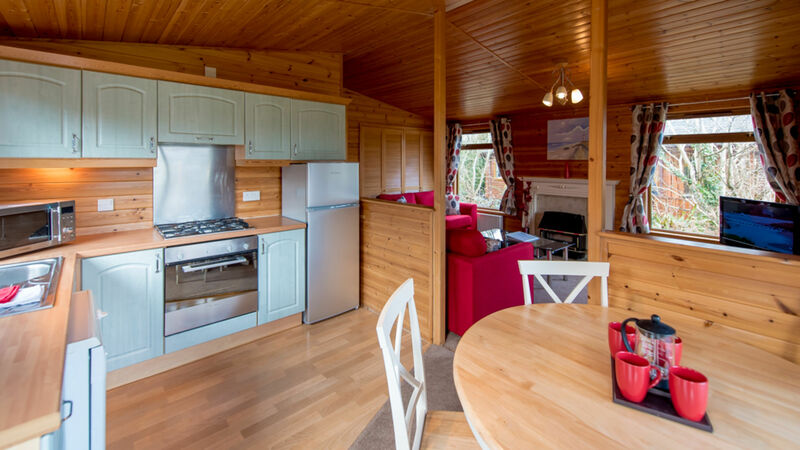 The kitchen is contemporary and well equipped with a large cooker, built in dishwasher, fridge freezer, toaster and microwave. 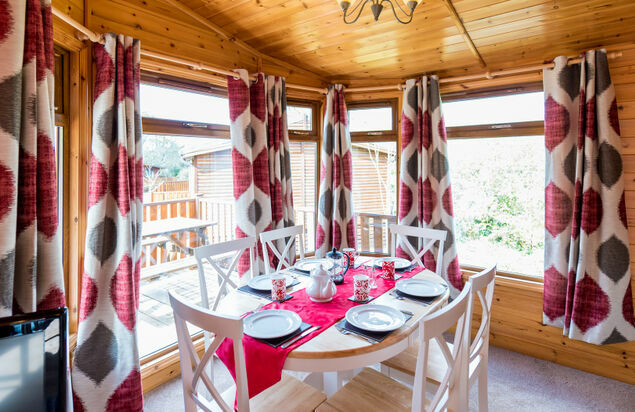 There is also a breakfast bar and a separate dining area complete with modern dining table and chairs that comfortably seats six people. 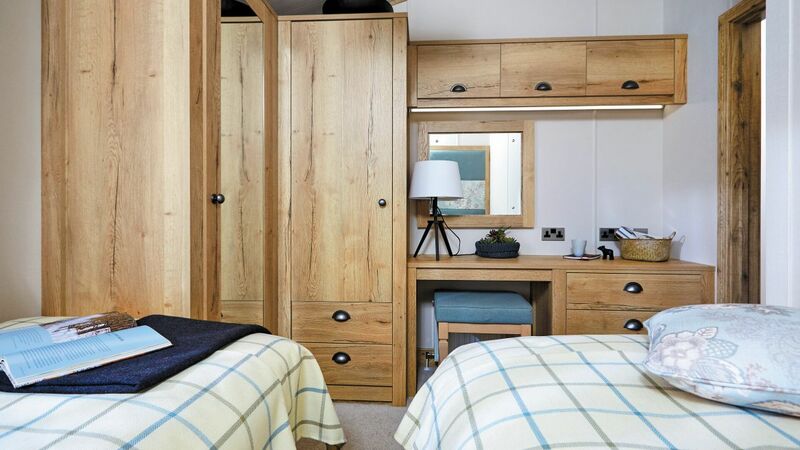 The three bedrooms are situated at the rear of the Larch Plus, the master bedroom boasts a king size bed and ensuite shower room. 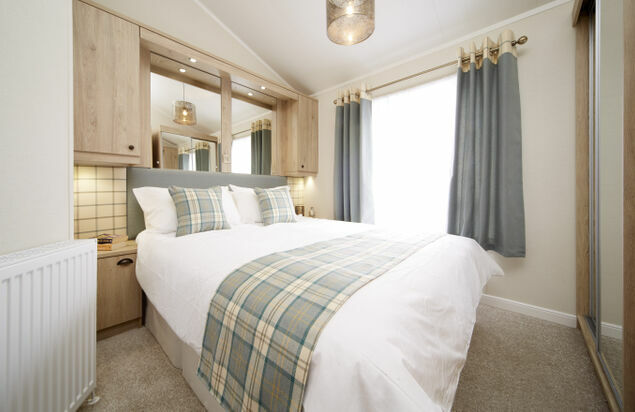 The twin bedrooms all have full size single beds and all beds come with signature pocket sprung mattresses. 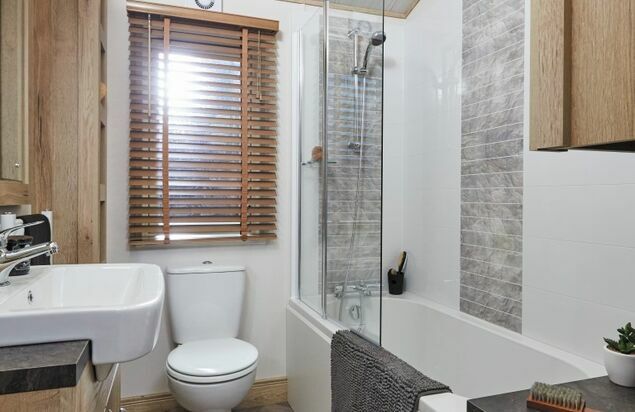 There is a family bathroom with a white three piece suite that includes a full size bath. 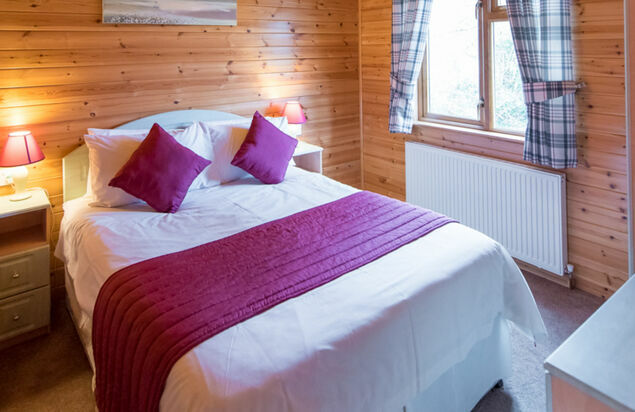 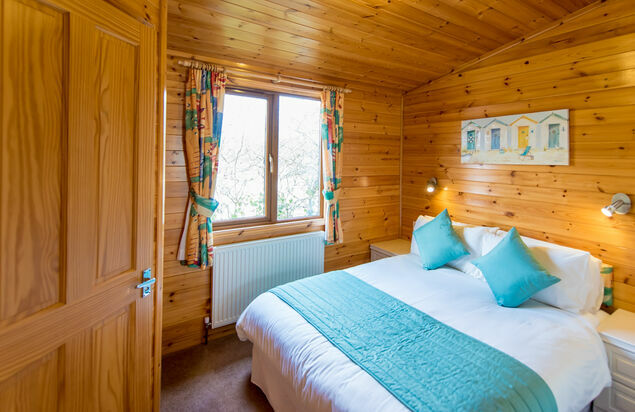 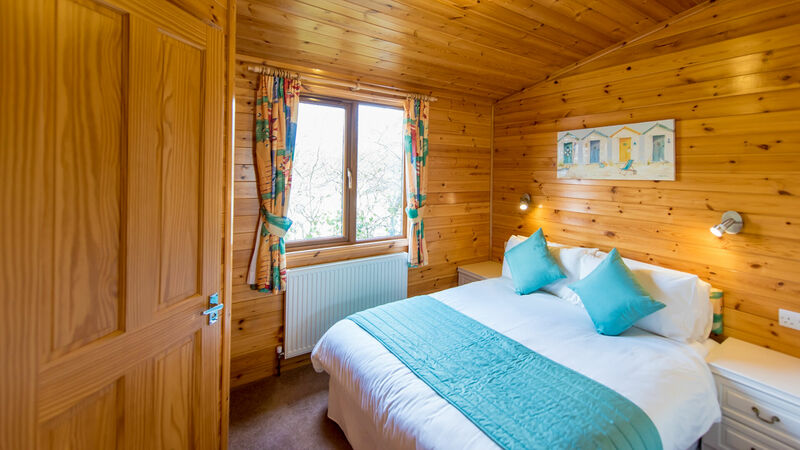 For extra comfort, all our lodges are fully double glazed and centrally heated and are supplied with all pillows, duvets and bed linen. 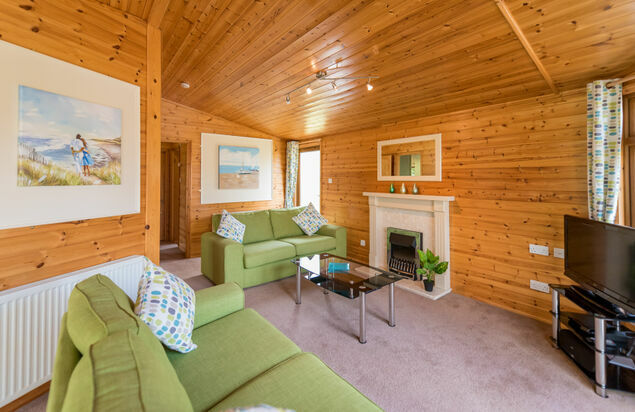 Accessed through double patio doors from the lounge area, there is also a private terrace where you can enjoy outdoor living which in turn leads to the outdoor hot tub at the side of the lodge which is situated in a delightful secluded location. 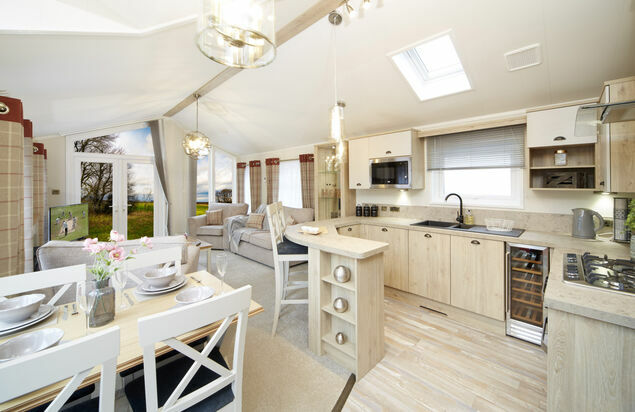 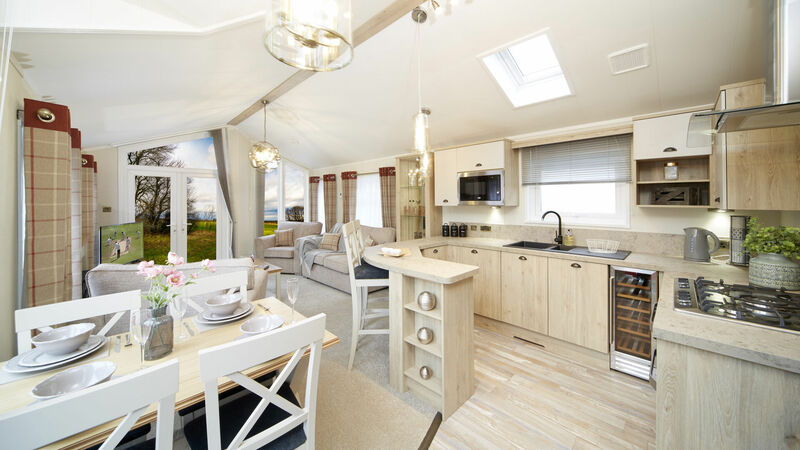 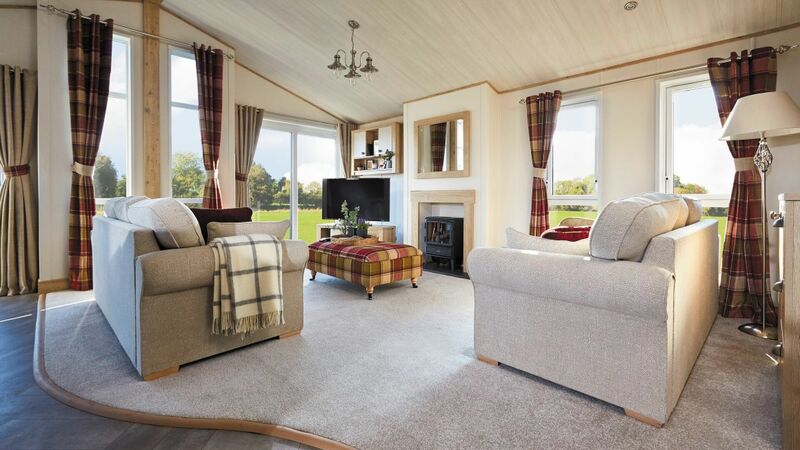 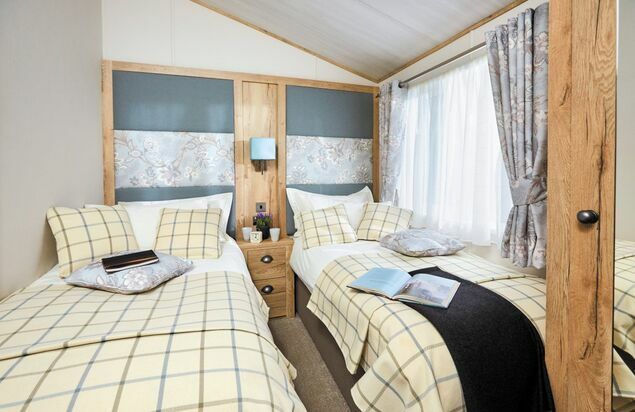 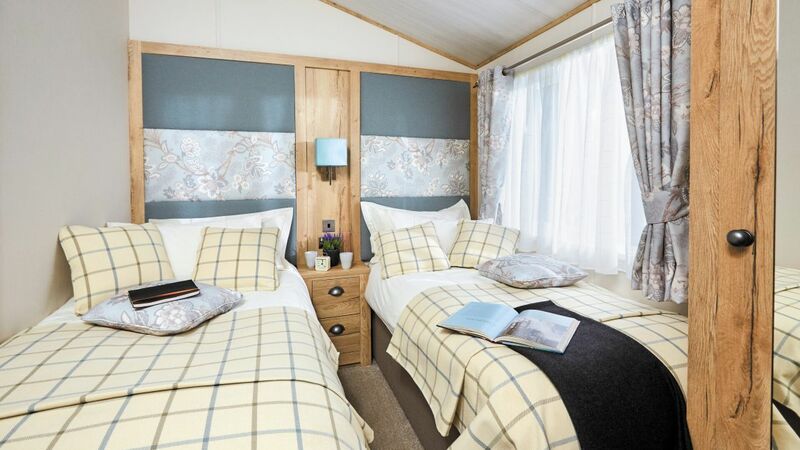 Our Cedar Lodge Plus accommodation were brand new in 2018 and are a fabulous addition to our accommodation range. 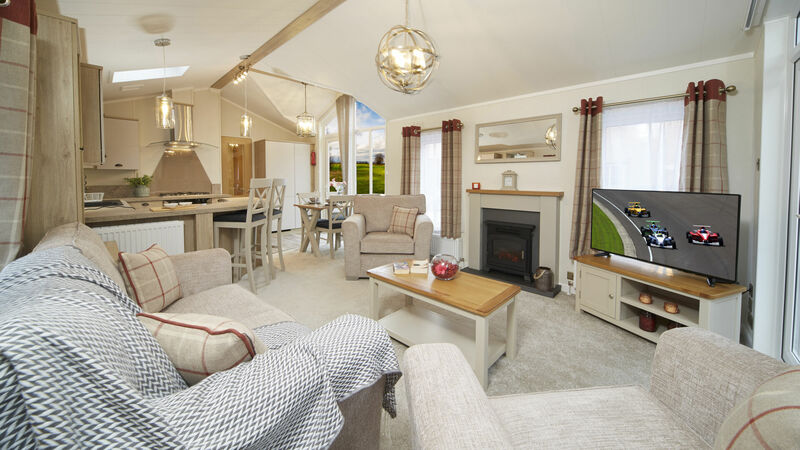 These exceptional holiday homes boast an open plan kitchen/lounge/diner with sofa and two arm chairs, feature fireplace, TV, DVD player and Bluetooth sound system. 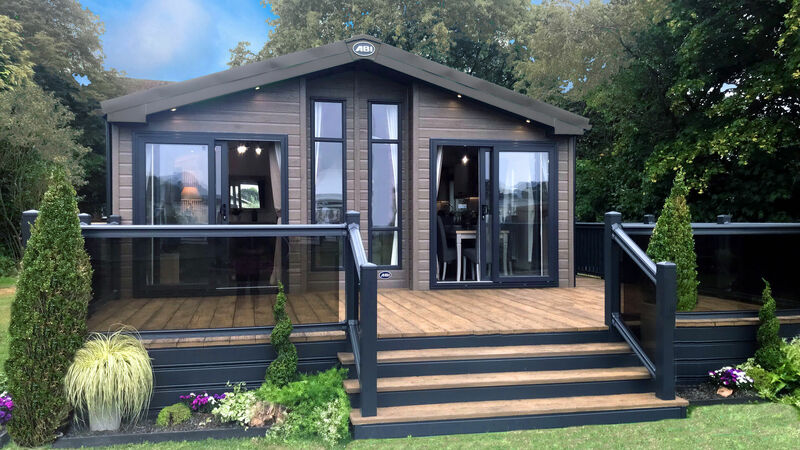 French doors provide plenty of natural light and lead to your own private terrace and hot tub where you can make the most of outdoor living. 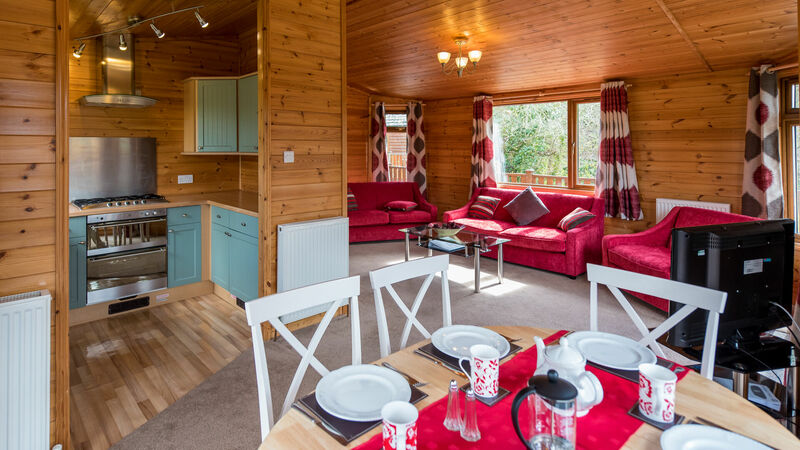 The well equipped kitchen/diner is modern and has a large cooker & fridge, toaster, microwave, dishwasher and even a wine cooler,as well as all the utensils and cutlery you could possibly need. 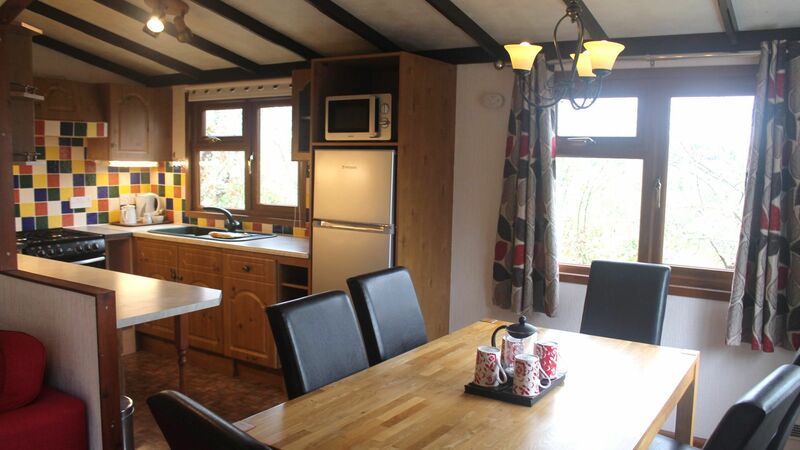 The dining area comfortably seats 4 people around the dining table but there is also a breakfast bar with two stools. 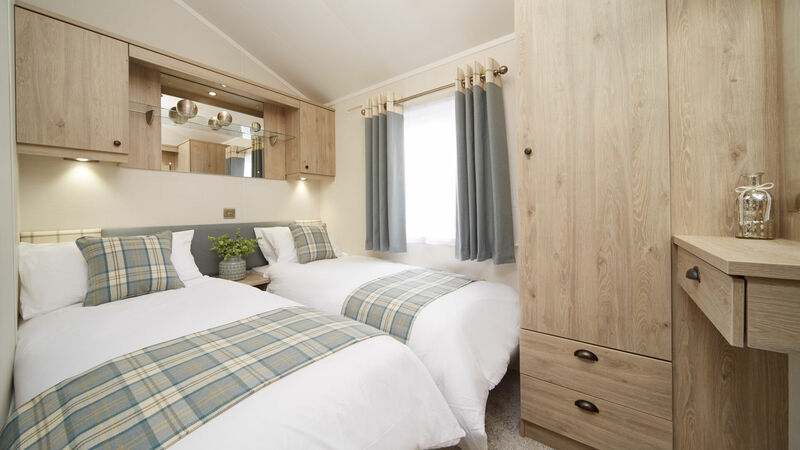 The master bedroom has a king size bed and plenty of storage space for all your belongings, it also comes complete with an en suite with bath and shower over, WC and wash hand basin. 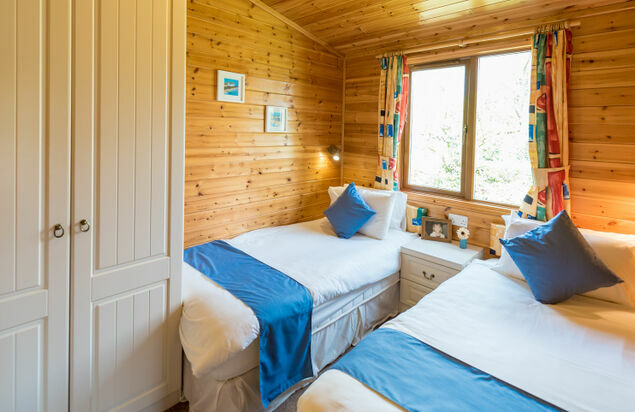 The comfortable twin bedroom has two standard size single beds and across the hallway there is a separate large family shower room with WC and hand basin. 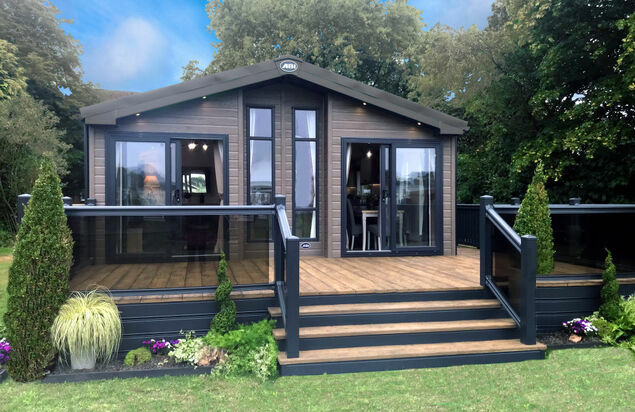 For extra comfort, these lodges are built to residential specification and are fully double glazed and centrally heated. 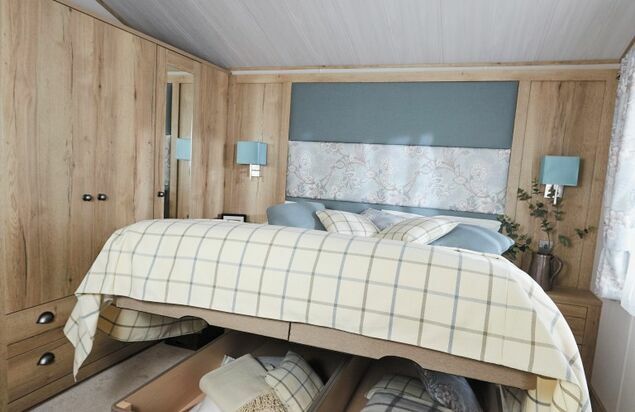 All pillows, duvets and bed linen are supplied. 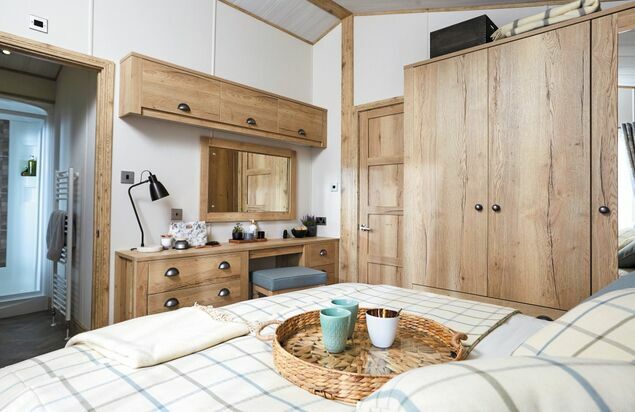 The centrally heated Oak Lodges are extremely popular with larger families who enjoy relaxed, modern, open plan living. 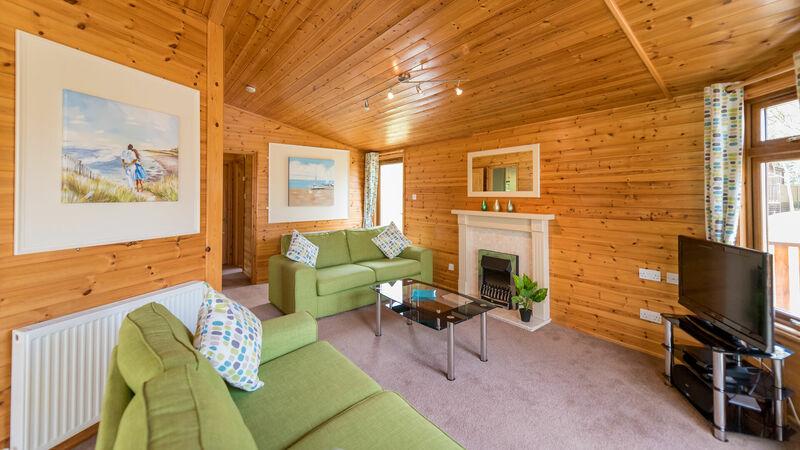 The lounge area provides you with comfy sofas, a feature fireplace, TV DVD player and Bluetooth sound system so you can put your feet up and relax. 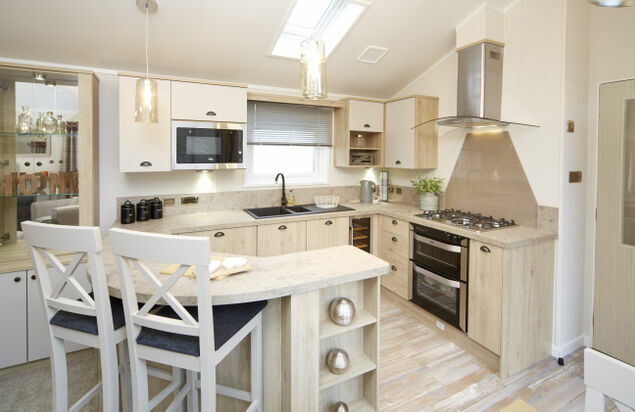 The kitchen is modern with a shaker style kitchen and plenty of built in appliances such as cooker, fridge and dishwasher not to mention all the cooking utensils you need to cook up a storm. 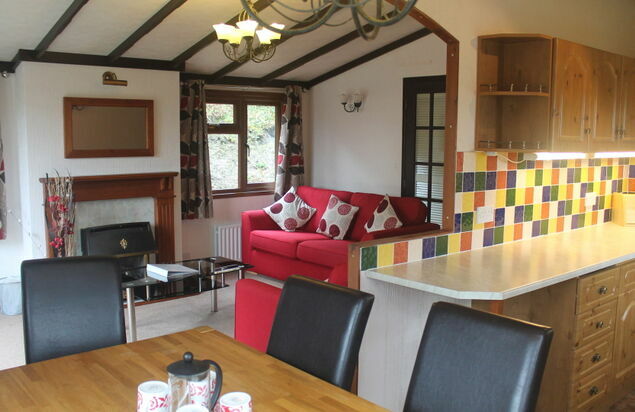 The dining area is situated just off of the kitchen. 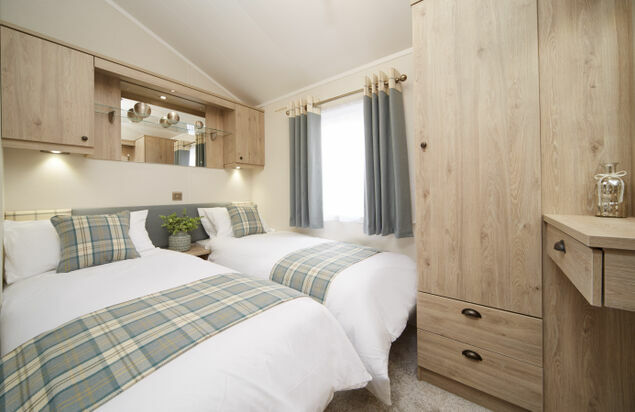 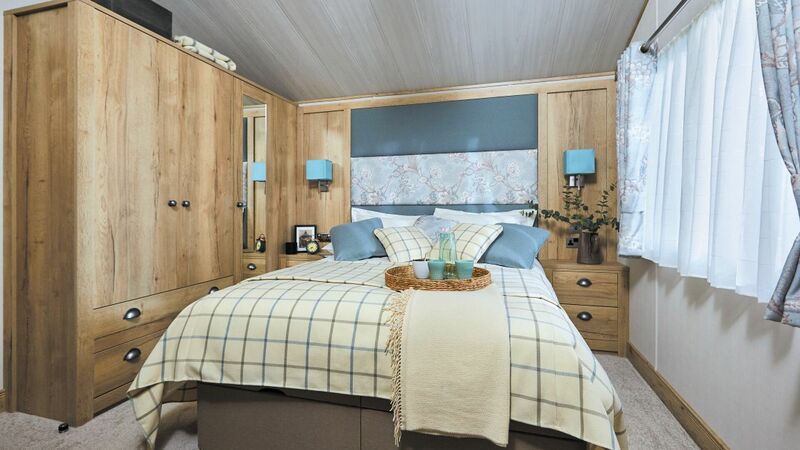 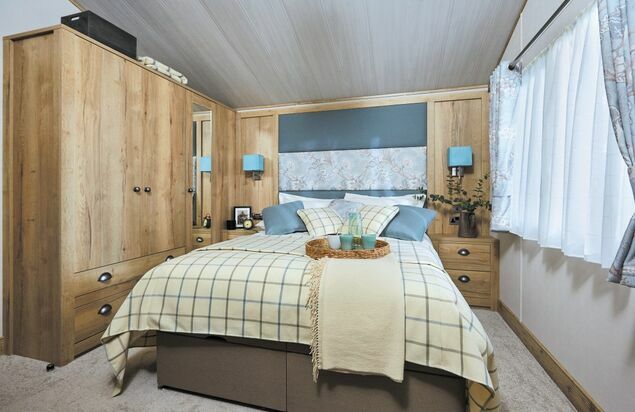 There are three bedrooms in our Oak Lodge holiday homes, one double and two twin bedrooms that provide you with your own peaceful haven. 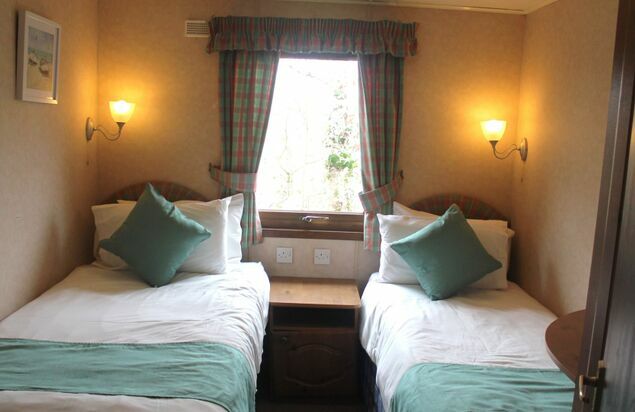 Pillows, duvets and bed linen are all provided. 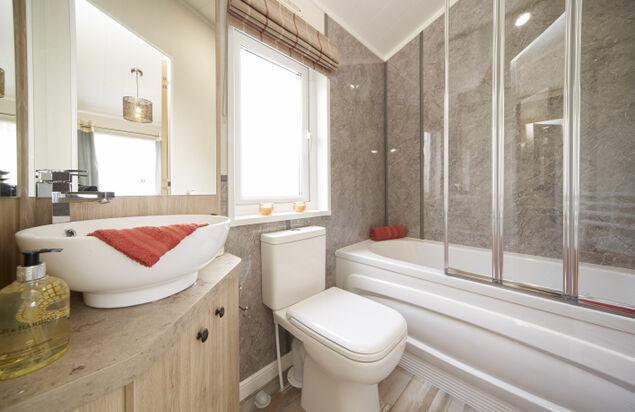 The family bathroom boasts a full size bath with shower over, wash hand basin and a WC. 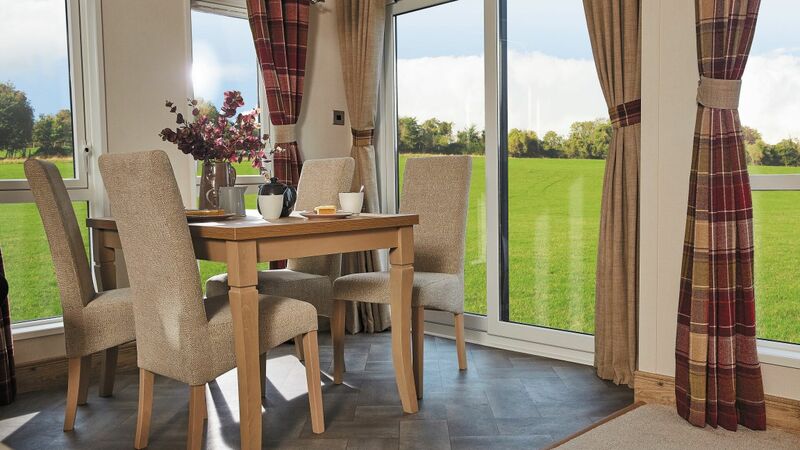 From the lounge area you have access to your own private terrace where you can make the most of the outdoors. 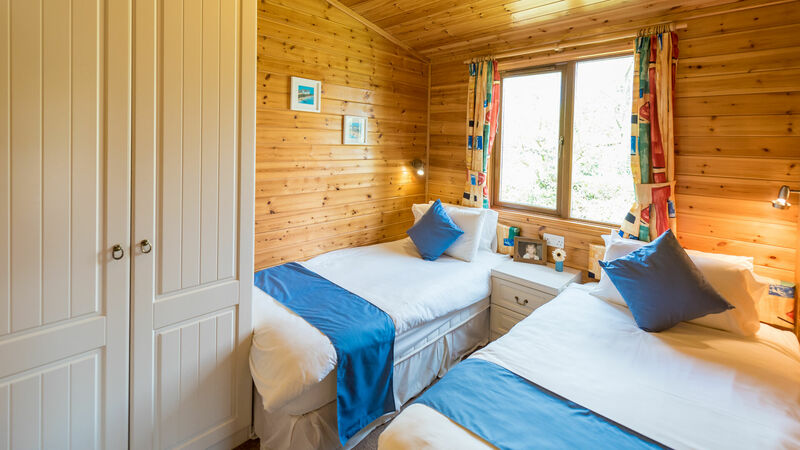 Our Oak Lodge Dog Friendly accommodation are a firm favourite with larger families who want to bring their dogs with them on their holiday. 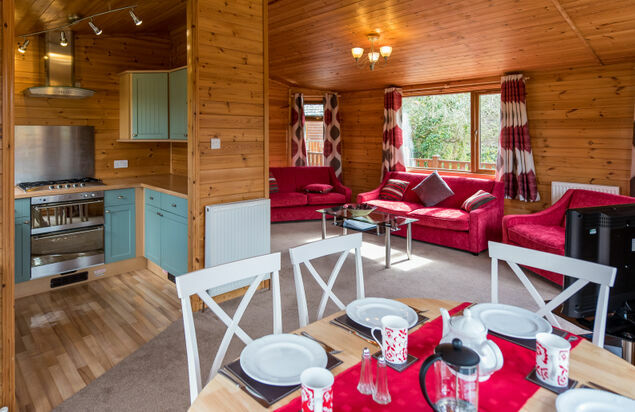 These lodges offer open plan living which make it perfect for all of the family to spend time together. 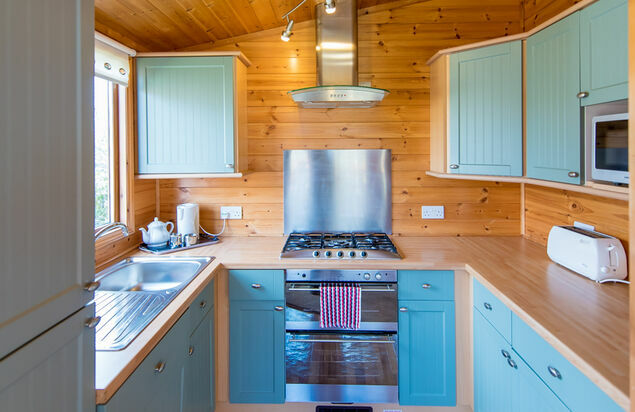 The kitchen has a large cooker with extractor over, built in appliances such as fridge and dishwasher with a toaster, microwave and all the utensils and cutlery you could possibly need to rustle up some gourmet delights. 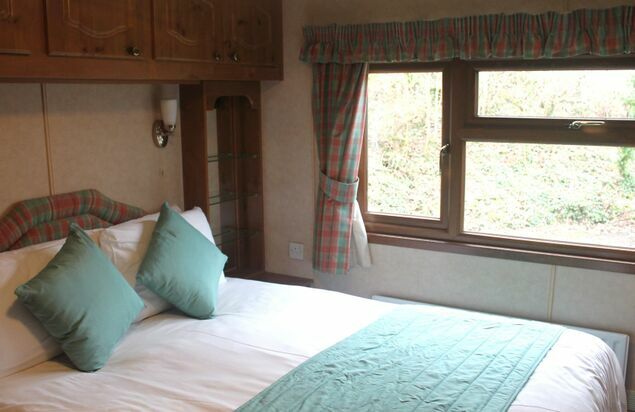 There are three bedrooms in the Oak Lodge Dog Friendly, the master double bedroom and two twin rooms. 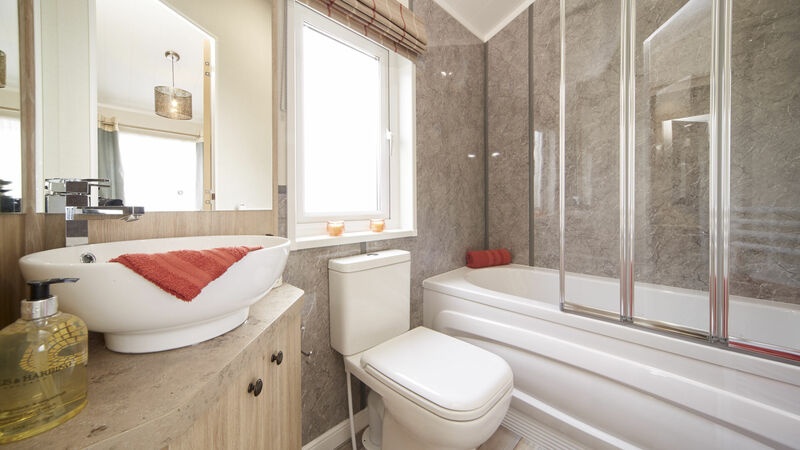 The family bathroom boasts a full size bath with shower over, wash hand basin and a WC. 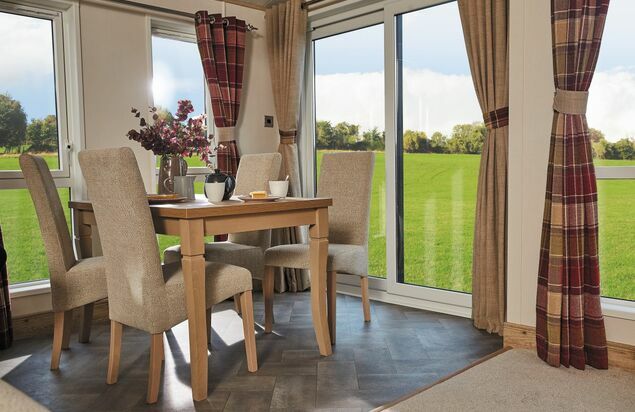 From the lounge area patio doors lead to your own private terrace where you can make the most of the cornish weather. 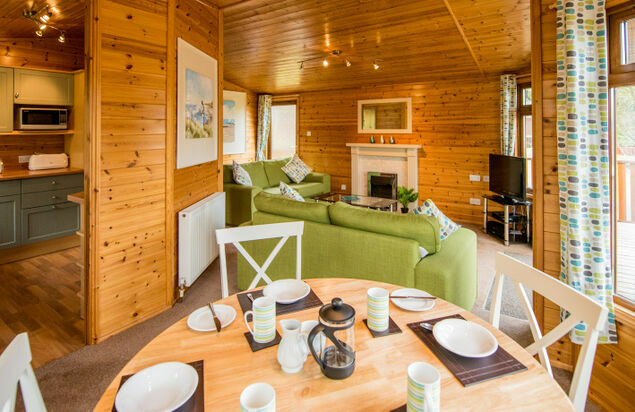 If you“re looking to bring your four legged friend on holiday then our Oak Plus Dog Friendly lodges are just what you“re looking for. 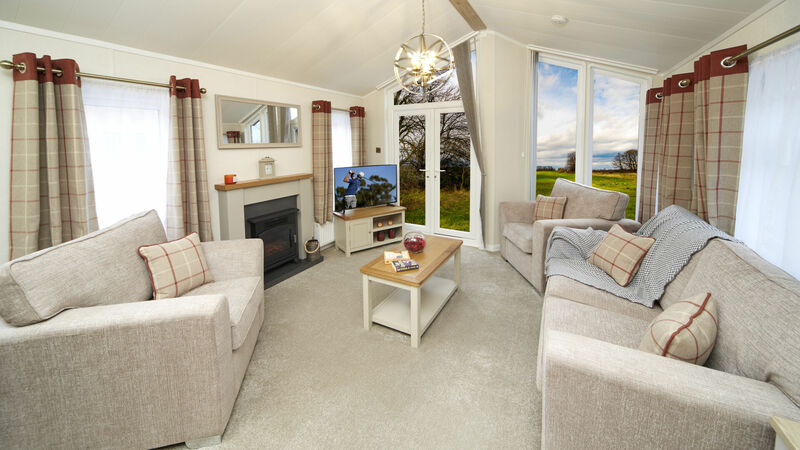 The living space is generous and provides you with relaxed open plan living which is great for socialising and spending time together. 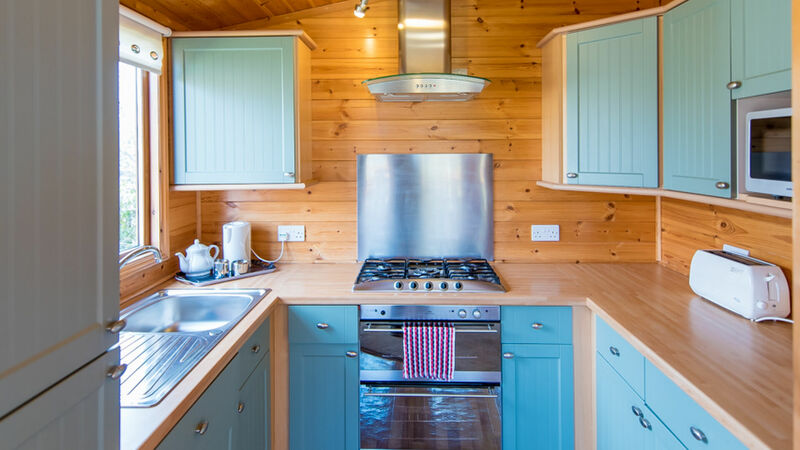 The well equipped kitchen has a cooker with extractor over, built in appliances such as fridge and dishwasher with a toaster, microwave and plenty of utensils and cutlery. 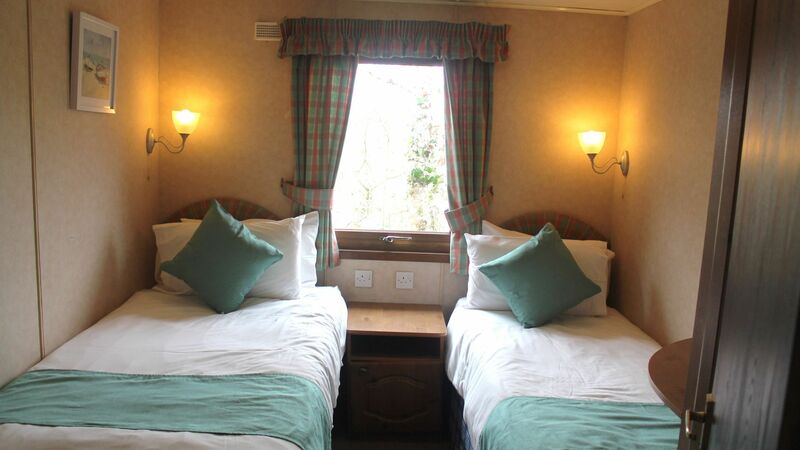 The dining area comfortably seats 6 people. 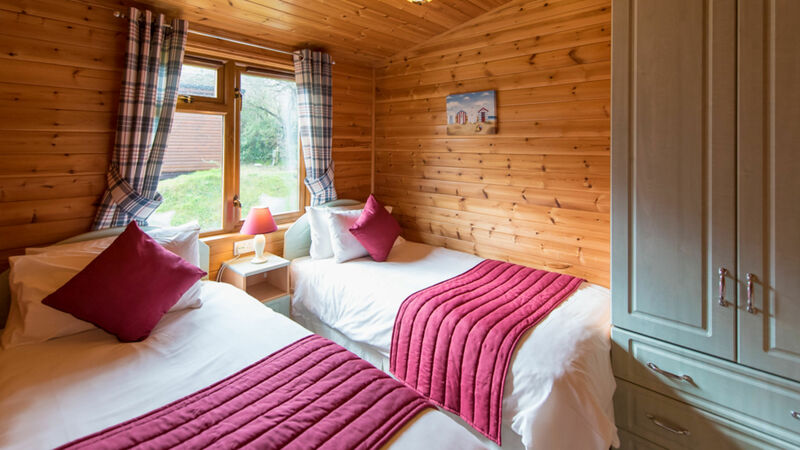 The three bedrooms (one double and two twin) are situated at the back of the lodge and offer comfy beds and plenty of storage. 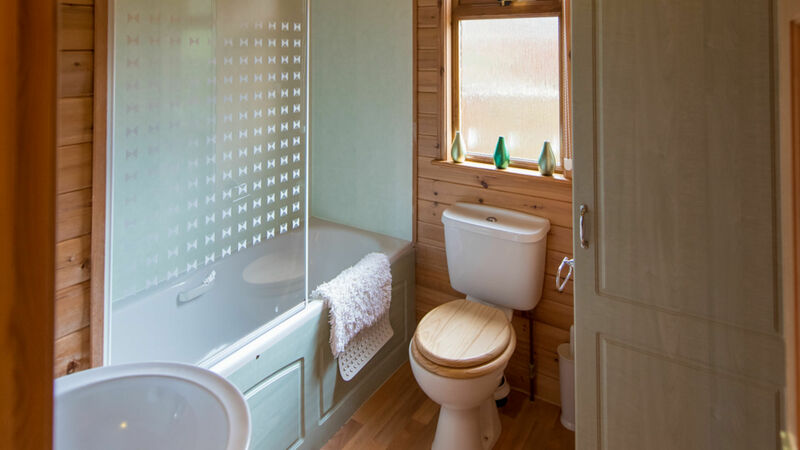 There is a family bathroom comprising a full size bath with shower over, wash hand basin and a WC. 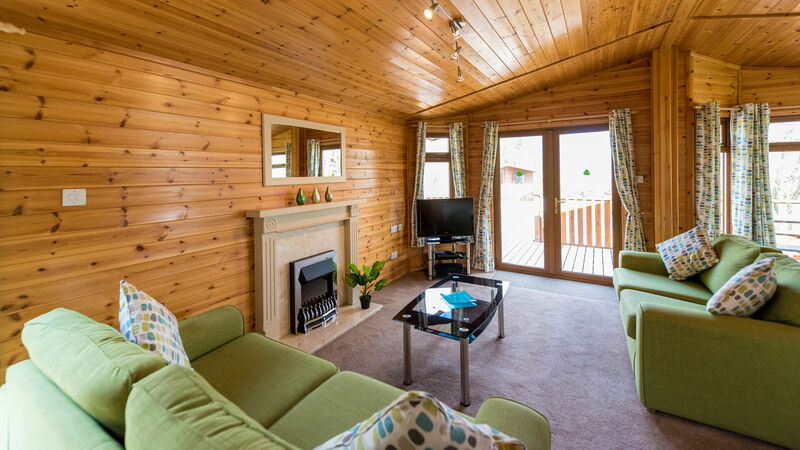 Accessed through double patio doors from the lounge area, each lodge has its own private terrace where you can enjoy some time in your hot tub and watch the sun go down. 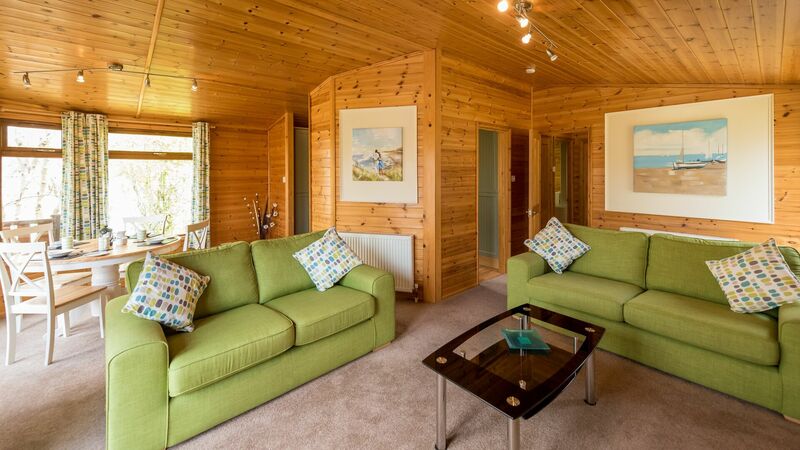 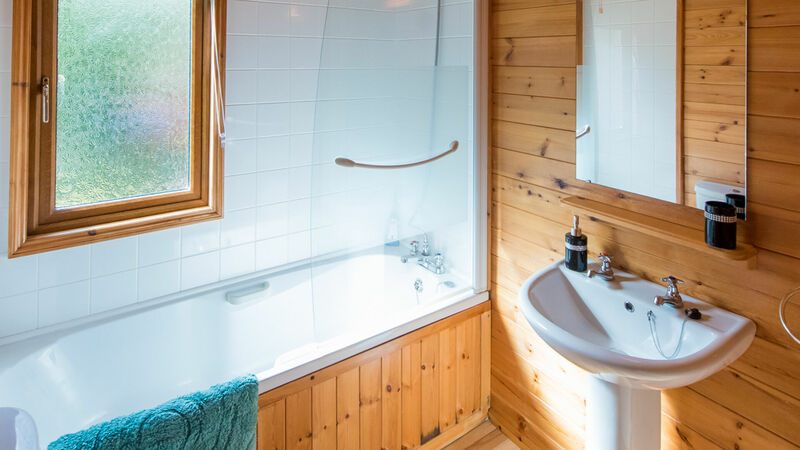 Our Maple Plus Lodges are stylish and spacious and come with their own private terrace and secluded hot tub. 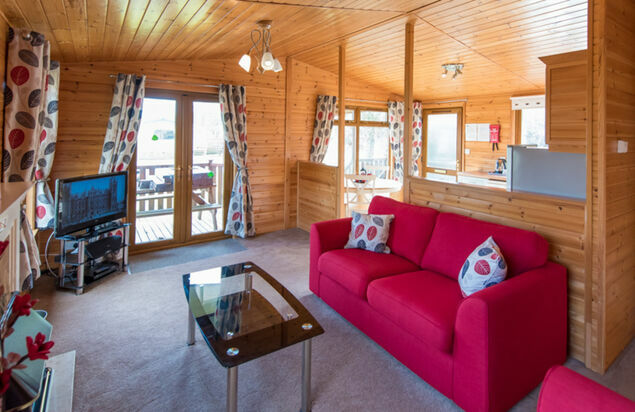 These holiday lodges provide you with a fantastic base from which to explore the wonders that Cornwall has to offer. 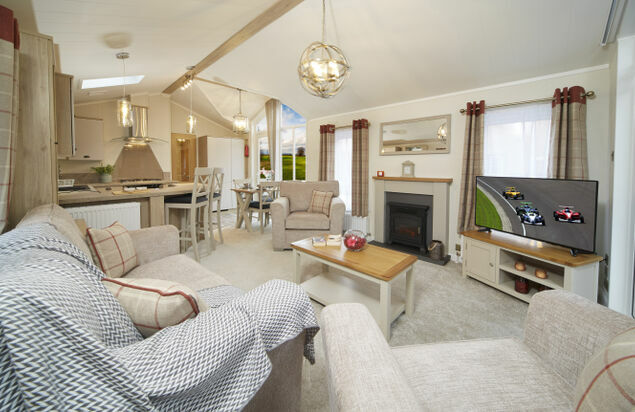 When you return from a fun filled day out you can pop your feet up on comfy sofas and watch a film or maybe listen to your favourite tunes. 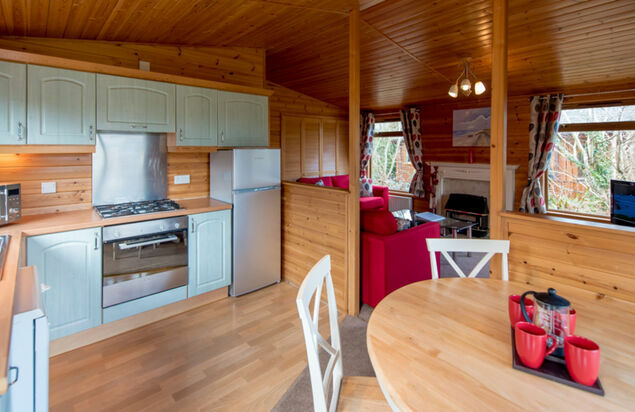 Mealtimes are easy when you stay in the Maple as the kitchen has an oven and built in appliances such as fridge and dishwasher and a toaster and microwave and the dining area is situated just off of the kitchen. 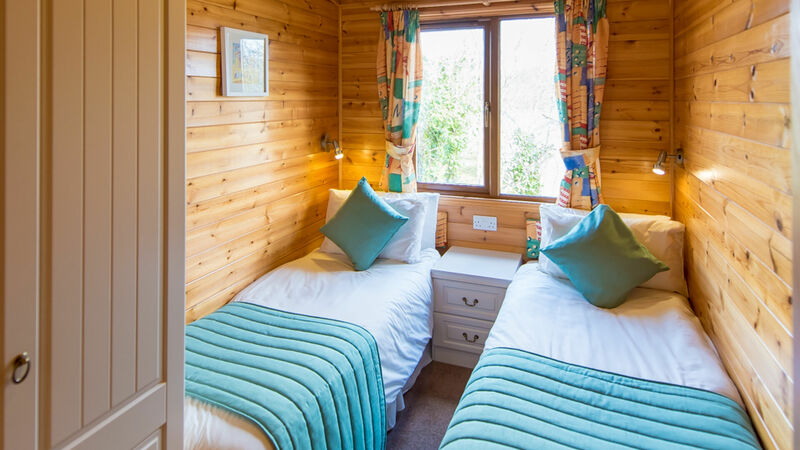 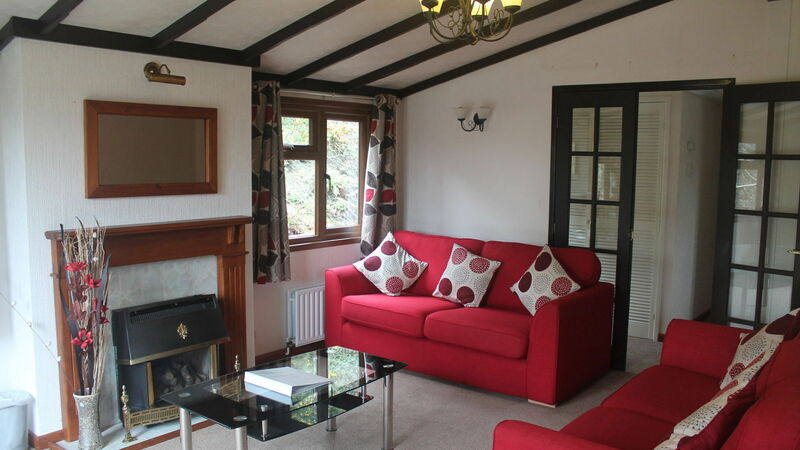 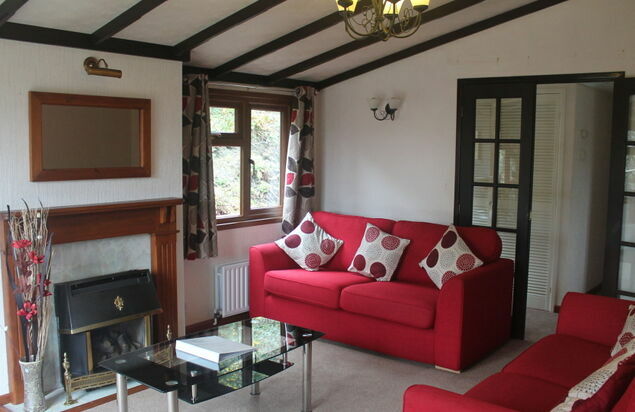 There are two bedrooms in the Maple Lodge (one double and one twin) and these are situated at the back of the lodge. 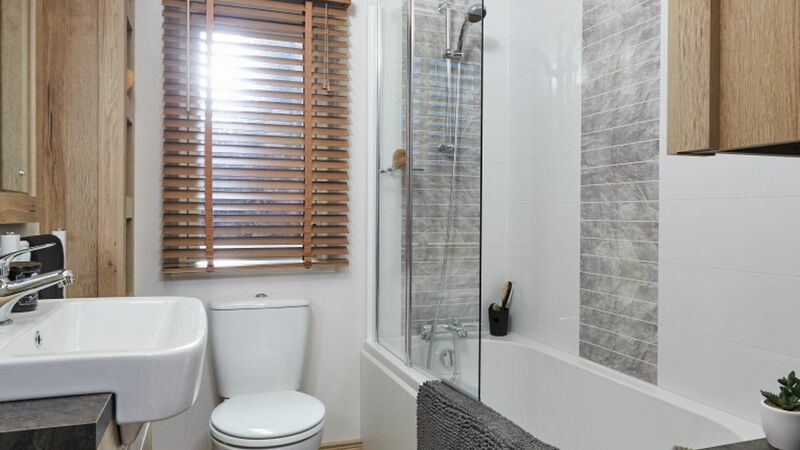 The master bedroom comes with its own ensuite shower room and there is also a family bathroom with full size bath with shower over, wash hand basin and a WC. 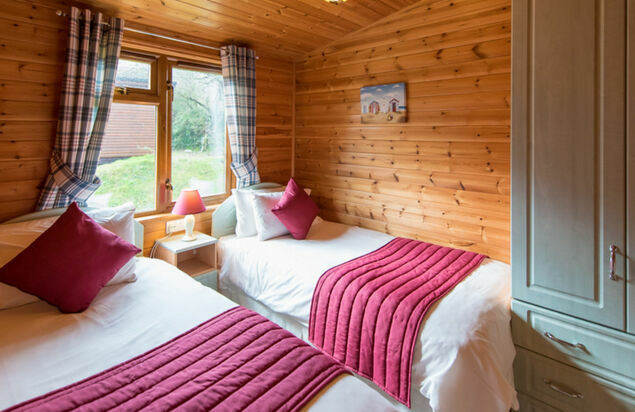 Our Maple Plus Dog Friendly Lodge is perfect for those of you who are looking for dog friendly accommodation. 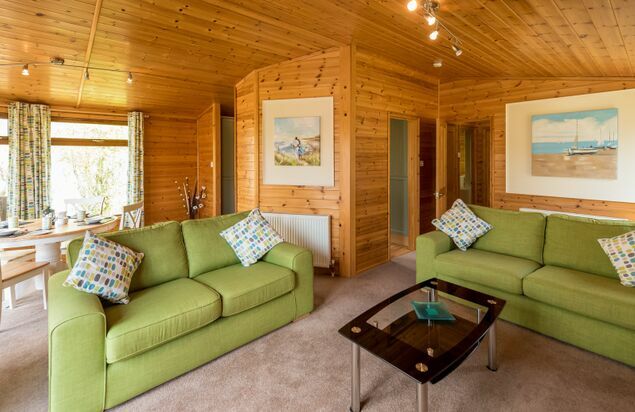 This lodge is a home from home and includes your very own private terrace and a secluded hot tub. 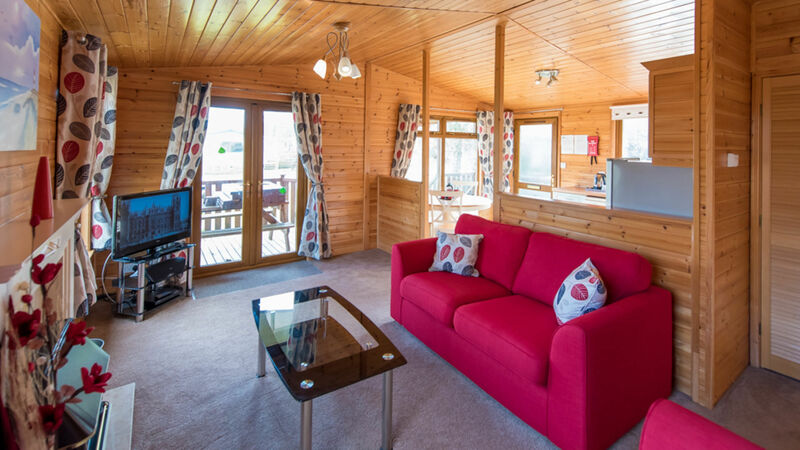 The Maple Plus Dog Friendly provides you with a fantastic base from which you and your dog(s) can discover the very best that Cornwall has to offer. 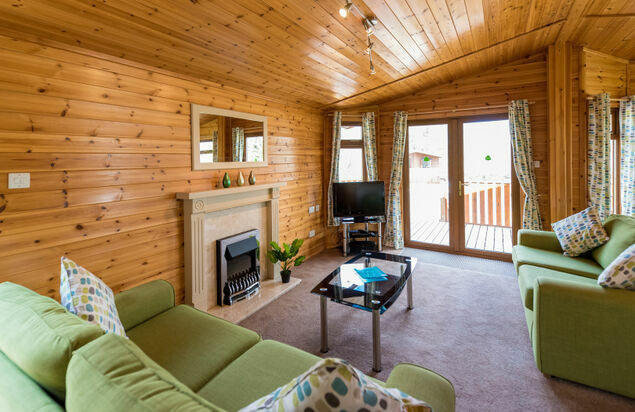 All of the family can relax in this comfortable lodge. 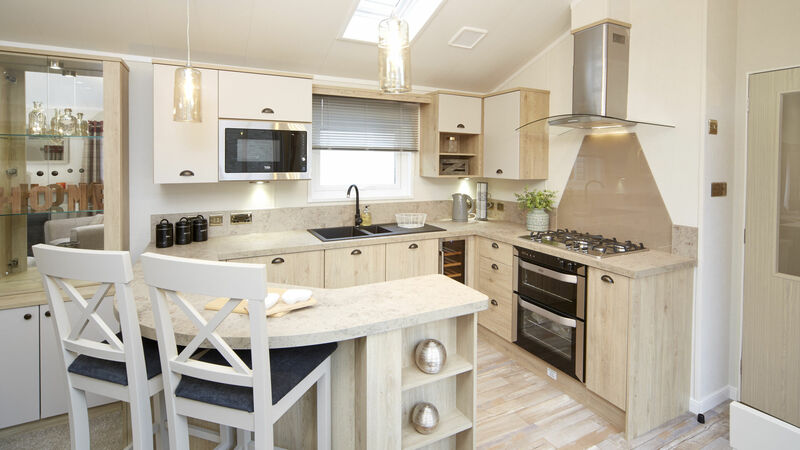 Our Maple kitchen boasts a range of built in appliances which include a fridge, dishwasher, toaster and microwave. 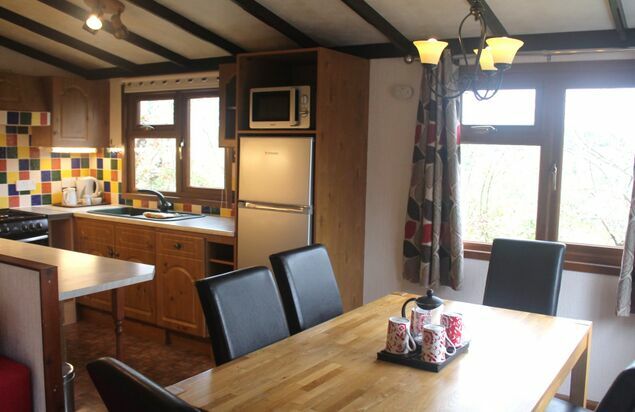 The dining area is situated just off of the kitchen. 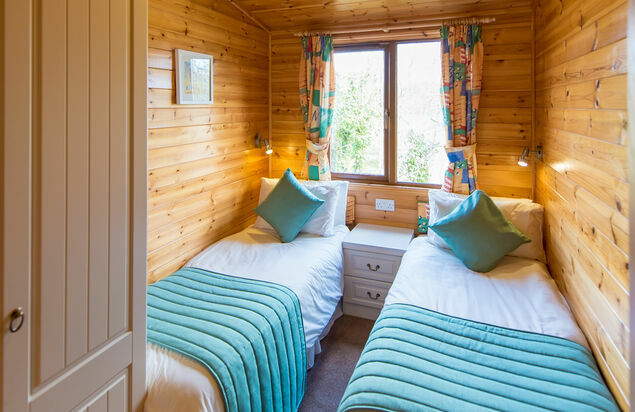 There are two bedrooms in the Maple Lodge (one double and one twin). 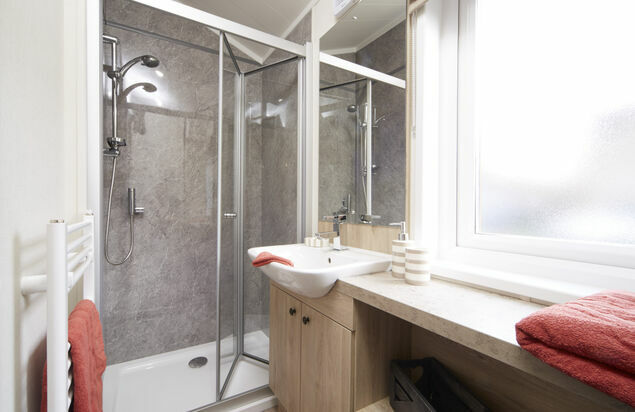 The master bedroom comes with its own ensuite shower room and there is also a family bathroom with full size bath with shower over, wash hand basin and a WC. 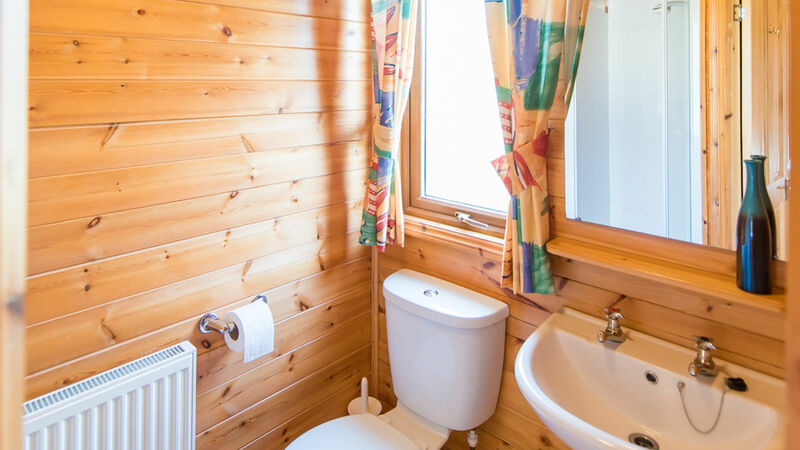 For extra comfort, all our lodges are fully double glazed and centrally heated. 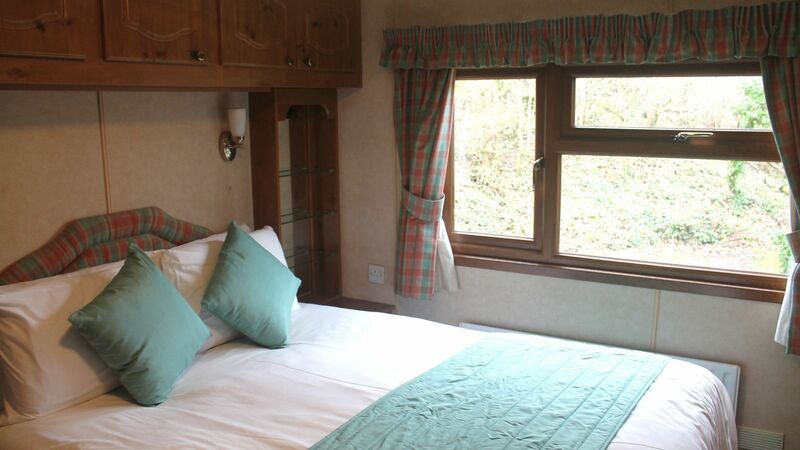 All are supplied with pillows, duvets and bed linen. 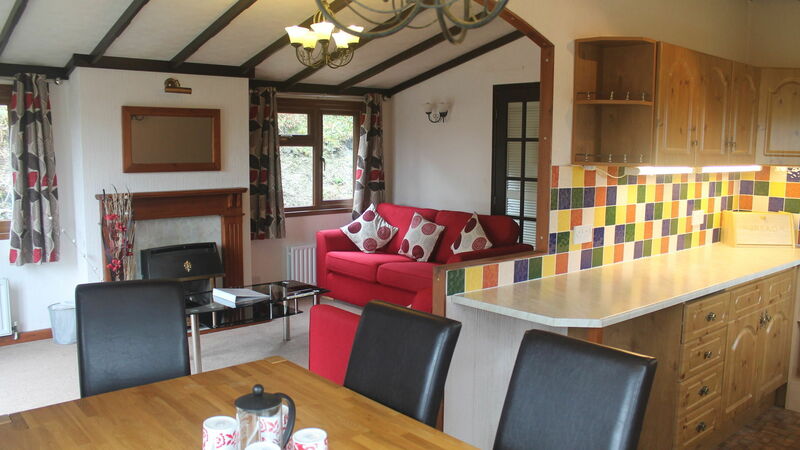 One dog is included in the price, an additional dog may be added for £40. 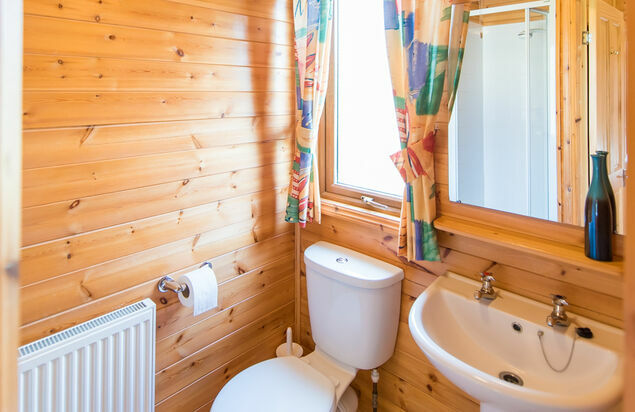 There is a maximum of two dogs per unit. 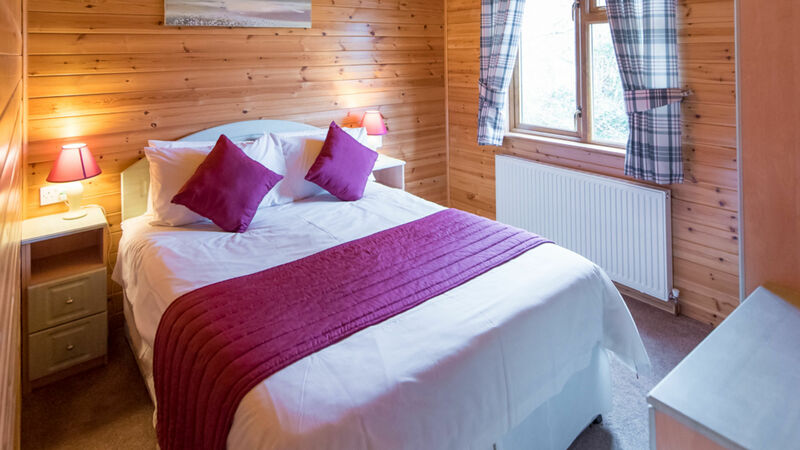 The Birch lodge Plus offers superior accommodation where the emphasis is very much on comfort, with high quality fixtures and fittings to ensure you have the very best during your stay. 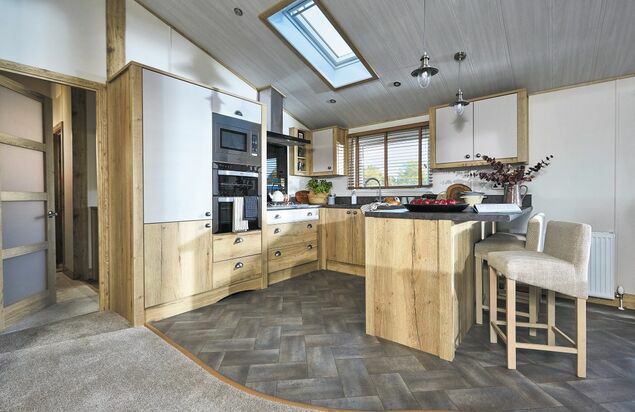 All your home comforts can be found in the Birch, there“s a TV, DVD Player and Bluetooth sound system in the living area so when you“re not out making the most of the sights you can keep yourself entertained. 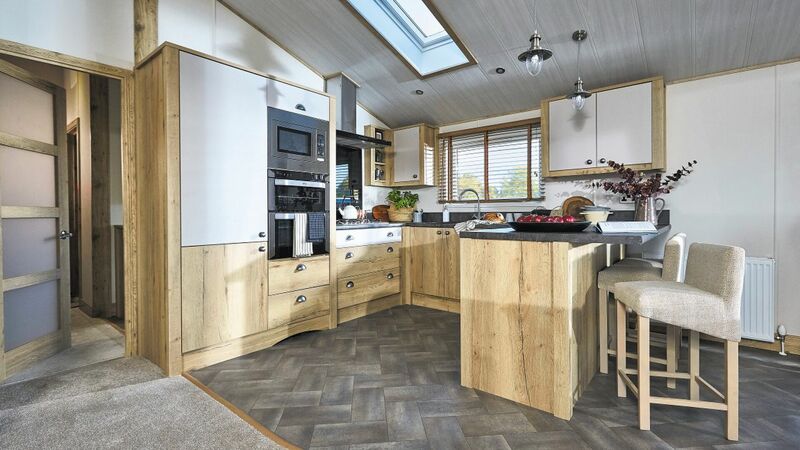 The shaker style kitchen is modern and comes with a cooker and built in appliances such as fridge and dishwasher and a toaster and microwave plus, plenty of utensils and cutlery. 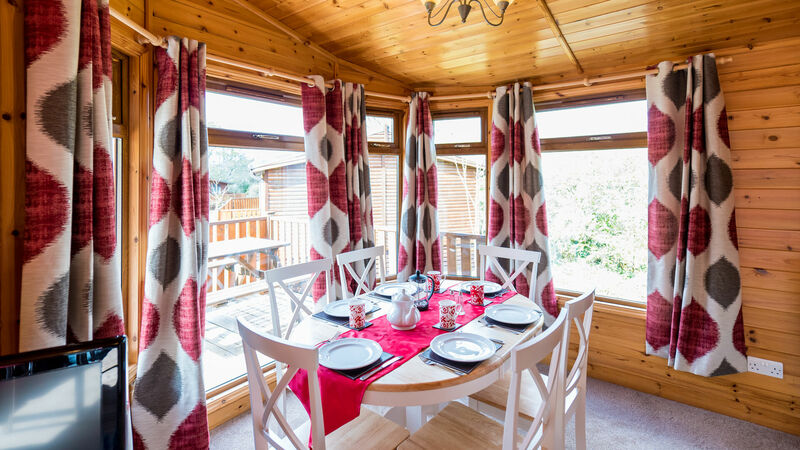 The dining area comfortably seats 4 people around the dining table. 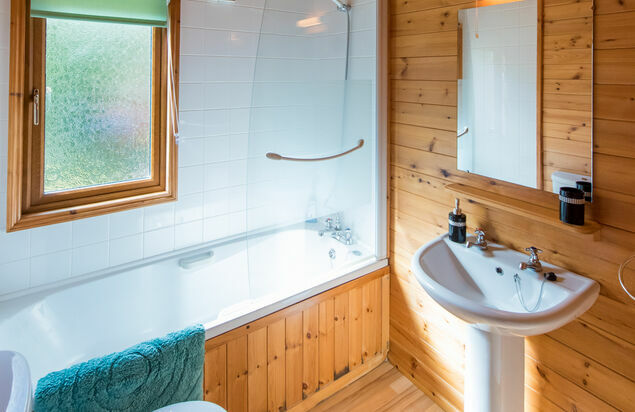 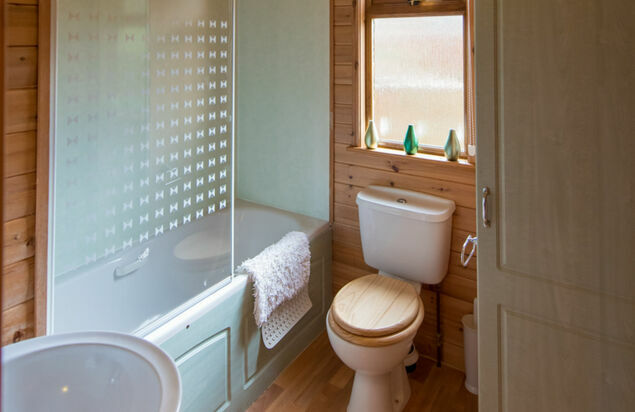 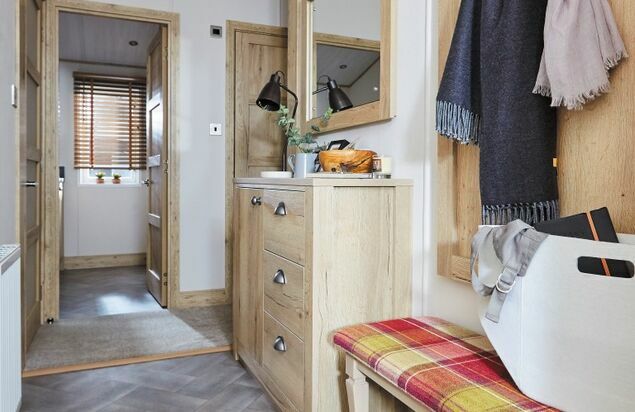 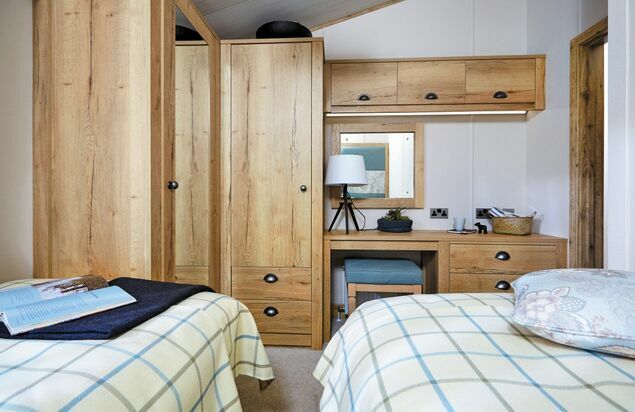 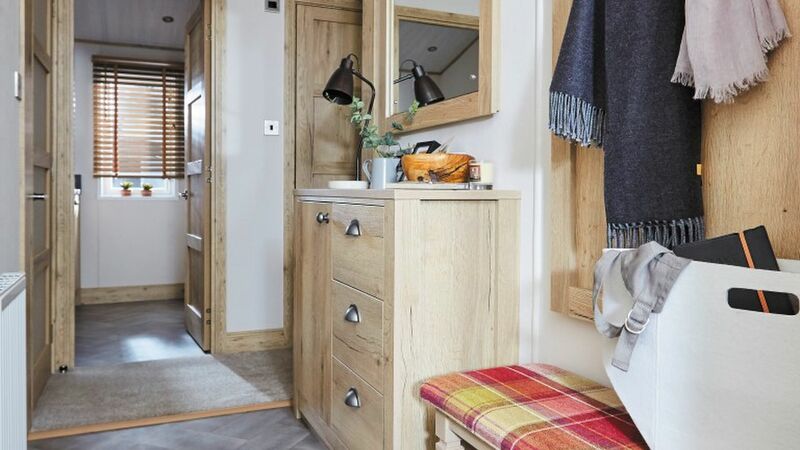 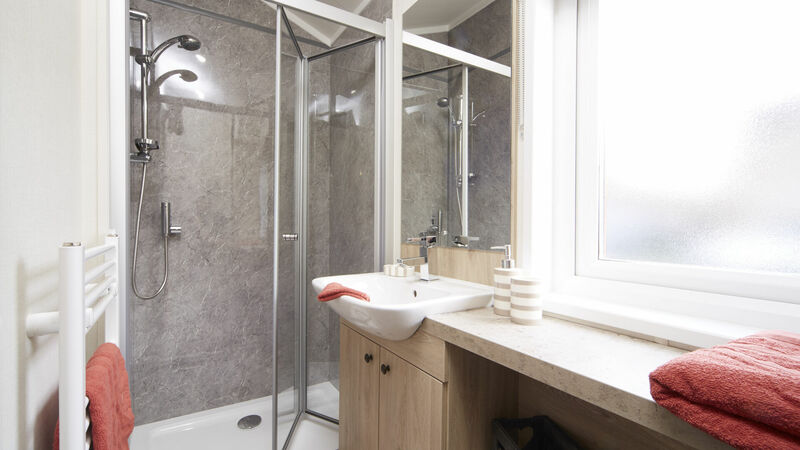 The two bedrooms (one double and one twin) in the Birch can be found at the rear of the lodge and the family bathroom offers a full size bath with shower over, wash hand basin and a WC. 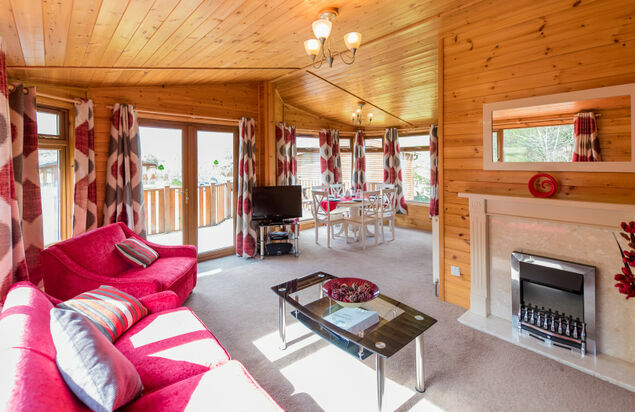 Outside and the Birch has its own private terrace with canopy and a hot tub.